Your family holiday is all set to go in our classic Kiwi-bach-style Coastal Cottage. Bring your relatives or friends and settle in, a short walk (under 100m) through the park on to the dunes and beach. You're close to our playground and communal hub, and have your own fenced garden, sunny deck, and barbeque. No. 11 on Resort Map, opposite Reception. Lounge: Digital 'Freeview' television and DVD player, dining table, couches. Kitchen: Full electric stove, fridge/freezer, microwave, plunger, all utensils supplied. Bathroom: bath and shower, toilet and vanity. Washing machine (clothesline outside). This room is not serviced. Room Bedding: Queen bed in main bedroom and second bedroom. Third bedroom has two sets of bunks. All linen included. Please note: All pricing is based on two people. Additional cost applies for extra adults and children. Our classic Coastal Cabins give you privacy and convenience with your own en-suite bathroom and kitchenette, and easy space for a couple or trio. You have a deck area sheltered by sub-tropical plants and views of the park. Less than 75m to the beach. Cabins No. 4-7 on Resort Map. Lounge: Bunk Bed, Queen bed, small dining table, kitchenette. Digital 'Freeview' television. Kitchenette: Fridge, two-element cook top, microwave, jug, toaster, plunger, all utensils supplied. Bathroom: shower, toilet, sink. Towels provided. This Cabin is not serviced. Room Bedding: All linen provided. Queen bed and bunk bed both in main room. Our Large Coastal Cabin offers you the convenience of an extra bedroom for your children or friends, in an affordable cosy cabin with kitchenette and private bathroom. Nestled just behind the dunes, you're a hop, skip and a jump from the beach (75m). You have a deck to relax on and lush garden area outside, while still being close to our communal hub and barbeques. Cabin No. 8 on Resort Map. Lounge: Digital 'Freeview' television. Couch, dining and kitchenette. Queen bed. Bedroom: Two sets of bunks. Kitchenette: Fridge, microwave, two-element cook top, toaster, jug, plunger, all utensils supplied. Bathroom: Next door, accessed from outside your cabin along the covered verandah. Private bathroom with your own key. Shower, toilet, sink. Towels provided. Portacot is available @ $12 per stay. Room Bedding: All linen provided. Queen bed in main room. Second room has two bunk beds (has external and internal doors). Our classic Coastal Kitchen cabins are cute and cosy, just across the lawn from the bathroom amenities and with your own outdoor seating area. 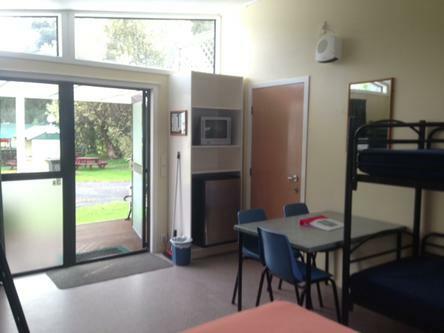 You're central to our communal hub for the barbeques and playground and just 150m to Hahei Beach. Cabins No. 1-2 on Resort Map. Kitchenette: Fridge, microwave, two-element cook top, jug, toaster, plunger, all utensils supplied. Room Bedding: Queen bed and set of single bunks. Linen provided. You're opposite our communal hub in the Coastal Kitchen Cabin with extra space and beds for friends and family. The kids can run out to the playground and you can cook up a barbeque then take it back to your sheltered balcony to enjoy. Your own kitchen room makes it easy to cater for the whole clan, and the bathrooms and showers are super close for your convenience. 130m through the park and dunes to Hahei Beach. Cabin No. 3B on Resort Map. Kitchen: two-element cook top, fridge/freezer, microwave, toaster, jug, plunger, all utensils supplied. Main room: Queen bed, 2 sets of bunks, dining table and chairs. Digital 'Freeview' television. Second room: 1 set of bunks. Can connect to our Large Coastal Cabin (3A) for bigger groups, please request. Room Bedding: Two bedrooms. Main room has queen bed and two sets of single bunks. Second bedroom (off the kitchen) has one set of single bunks. Linen provided. This Cabin is great for large families or groups such as schools or teams. You can spread out on the verandah and private courtyard with your own barbeques, and create a feast in your full kitchen/dining room. You're just around the corner from the amenities building for showers, toilets and laundry, and just 150m through the park on to Hahei Beach. Kitchen/Dining: Dining table, fridge/freezer, full stove , microwave, jug, toaster, plunger, all utensils for groups. Digital 'Freeview' television. Two bedrooms off the Kitchen each with a queen, single and set of bunks, with doors out onto the verandah. You can enjoy the classic camping experience but with the luxury of comfy beds and your own cosy space in one of our Comfort Coastal Cabins. You have easy access to our communal hub to use our full kitchen, bathroom amenities, barbeques and dining area. Your Cabin has a queen bed, set of bunks, table, chairs and fridge and a small balcony to relax on and enjoy your beach holiday. Cabins No. 9, 6A, however not in Annex 3 & 4 on Resort map. In addition to our Comfort Coastal Cabins we have two further small Annexes each with a queen bed and set of bunks and a small fridge. These are not shown in photos. Annex 3 & 4 on the Resort map. You can enjoy the classic camping experience but with the luxury of comfy beds and your own cosy space in one of our Basic Cabins. You have easy access to our communal hub to use our full kitchen, bathroom amenities, barbeques and dining area. Our Large Basic Cabins have a little extra space and beds for bigger families, along with a table, chairs, fridge, and balcony to relax and enjoy your holiday only 130m from the beach. Cabin No. 3A & Cabin 1A on Resort map. Cabin 3A can connect to our Large Kitchen Cabin (3B) for bigger groups, please request. Room Bedding: Queen bed and two sets of bunks. Linen provided.